I can hardly believe that we are almost finished the month of May WOW. This week the weather is suppose to be mostly rain, so I guess it will be a good week to work on some craft stuff and inside house stuff etc. We do need the rain, last week they had a fire ban because it was so dry so this will help with that and to green things up. 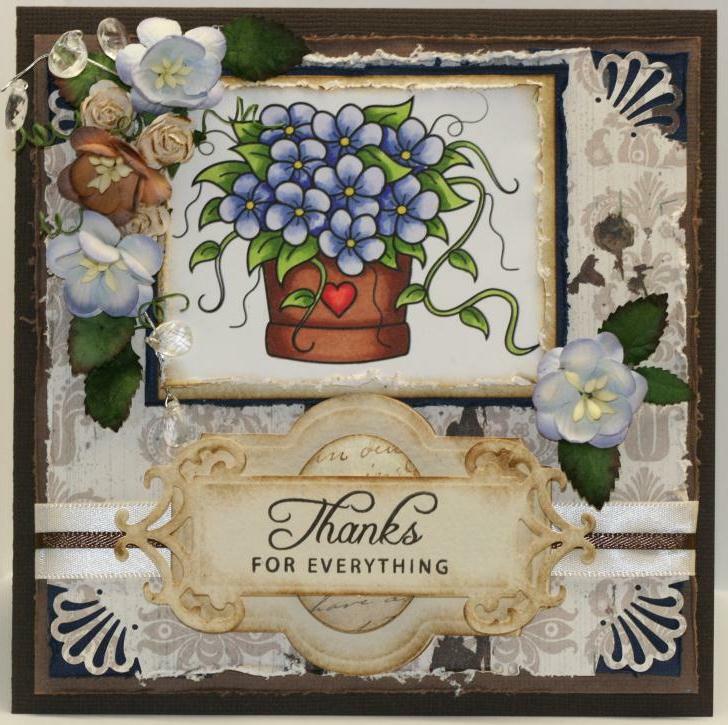 So I picked the image from Whimsy Stamps fromStampart called Full Bloom. I also added flowers and crystals from Whimsy Stamps. They come in different colors, I love the size of the flowers they are a great size for cards. I used punches for the corners and a number of spellbinders for the sentiment area. I also foam squared it up to give it lots of layers. This card is my first shabby chic anything, I hope that you will try to make something shabby chic if you do you should add it to Whimsy's inspiration challenge blog for a chance to win some really wonderful digital stamps. If you decide not to add your card at least click here and jump over to the Whimsy blog and maybe get some great ideas from the Dt team. Hope to see your image on the blog. Thanks for stopping by to take a look, hope to see you next week. Here is my shabby chic creation. A close up of my colored image " Full Bloom"
This is my layering under my sentiment, 3 spellbinders and foam squared in between each. So beautiful! Love the flowers. BAMMM...this is my new word for Wow! But better! Girl this is amazing, great job, love it....Gorgeoussssssssssss!